And in case that you need a comfortable and unique hairstyle, maybe the next words and tips will help you and will make your hair more beautiful. One that highlights your personality and at the same time, do not get upset when a lot of walking in the streets. 1. 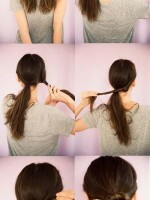 Comb your hair and divide it into two sections. One must be larger and the other smaller, to be located near the ear. 2. Now take the majority and then tie into a ponytail. 3. Twist small section away from your face – winding direction does not matter. But it is important to act tight so as not to spoil your hair then interesting. 4. Finally some twisted curl around the base of the tail and secure the stability of the resulting bun hairpins on both sides. That is everything, which you need to make your hairstyle. I really like this hairstyle. It is easy, comfortable and looking nice. It is perfect for a working girl. Thanks Rebecca! I am glad that you really liked the hairstyle.